It's only a few days into 2018, and we've already witnessed the year's first supermoon — when the full moon is closest to the Earth and appears 14 percent larger and 30 percent brighter than normal. Looking ahead through the rest of the year, however, there are a lot more celestial events to watch in 2018. Here are 12 more — one for each month. On the last day of the month, the super blue moon eclipse will have skywatchers all abuzz. On Jan. 31, this lunar event checks all the boxes of rare events that we don't see very often, and it's wrapped up into one. For starters, it's another supermoon since its orbit is still closest to the Earth. 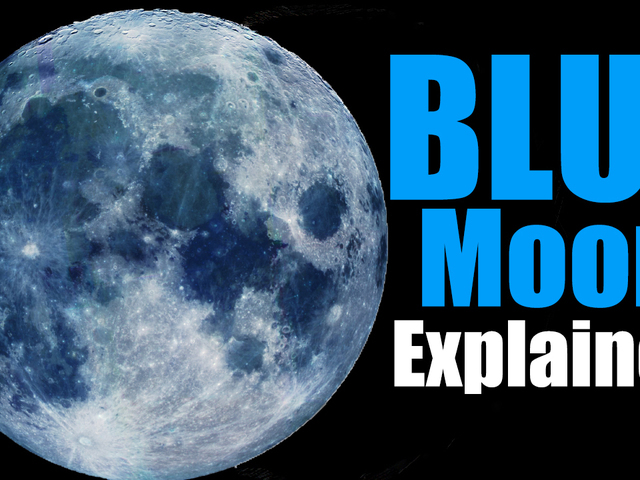 Secondly, it's the second full moon in January, making it a blue moon. And lastly, the moon is going to pass right through the Earth's shadow, setting the stage for a total lunar eclipse for most of the United States. On Feb. 10, if you're able to rise before the sun and look to the south-southeast, you'll have a good chance to see the moon sandwiched between Mars and Saturn. A little higher in the sky and along the same line, Jupiter will also be visible. This feature will be visible through most of February, but it's this morning when the moon is perfectly sandwiched between Mars and Saturn. A blue moon, or the second full moon in a single month, occurs on average every two and a half years. This year, however, there was a full moon on Jan. 1 and Jan. 31, no full moon in February (a black moon), and in March, there will be two full moons on March 1 and March 31. That second full moon on the last day of the month will be the second blue moon of 2018 — an extremely rare event. The last time this happened was 1999 when there were two full moons in January and two more in March. The next time will be January and March 2037. On April 22 and April 23, the Lyrids will peak with about 20 meteors every hour. This is an annual meteor shower produced by dust particles left behind by comet C/1861 G1 Thatcher, which was discovered in 1861. Fortunately for everyone looking up, the moon will set shortly after midnight, leaving a dark sky for anyone watching. If you miss April's meteor shower, May 6 and May 7 will likely put on a better show with up to 30 meteors per hour. This meteor shower, which runs every year from April 19 to May 28, is produced by the more well known Halley's comet. During the shower's peak, a larger waning gibbous moon (roughly three-quarters full) may block out some of the more faint meteors, but patient watchers should still see a good show. The planet most well-known for its rings will be at opposition on June 27, and it will be fully illuminated by the sun. Near the end of June, Saturn will be brighter than any other time of year, and you'll be able to view and photograph Saturn and its moons with a medium-sized or larger telescope. A month after Saturn is closest to the Earth, Mars will move closest to the Earth, appearing like a bright orange star in the southern sky. On July 31, Mars will be within 35.8 million miles of the Earth. Mars will be bigger and brighter than it's ever appeared since 2003, and it won't be this close again until 2035. Skywatchers always look forward to August for an annual meteor shower you can count on. On Aug. 12 and Aug. 13, the Perseids will peak, producing up to 60 meteors per hour. The Swift-Tuttle comet, discovered in 1862, produces these meteors every August, and this year, a thin crescent moon sets early, leaving dark skies for what could be the meteor shower of 2018. The farthest planet in our solar system (sorry Pluto) will be at its closest approach on Sept. 7. The giant blue planet will appear bigger and brighter than any other time of the year. However, since Neptune is so far away, it will look like a tiny blue dot in the sky unless you're using one of the most powerful telescopes. Another meteor shower will put on a show on Oct. 21 and Oct. 22. The Orionids are another annual meteor shower, also from dust particles left behind by Halley's comet. The shower runs every year through most of October, but unfortunately this year, a full moon will occur just two days after the peak, which means some faint meteors may go unseen. The Leonids are expected to produce up to 15 meteors per hour on Nov. 17 and Nov. 18. These meteors are dust grains from the Tempel-Tuttle comet, which was discovered in 1865. Another waxing gibbous moon will be in the sky, but fortunately for everyone looking up, the moon will set shortly after midnight, leaving dark skies for anyone watching. After a year of multiple meteor showers, which come from leftovers of comets, an actual comet may come close to the Earth. According to early predictions, the comet 46P/Wirtanen may be bright enough to see with the naked eye. If it does, it'll be the first comet we could see without a telescope in more than five years. The comet will be at its closest — 7.2 million miles — on Dec. 12 before it moves to the outer solar system. Now as we move through a new year, there's at least one reason to look to our solar system for a new spectacle each month. Follow Meteorologist Jason Meyers via the Storm Shield app on Twitter , Facebook , and YouTube . Download the Storm Shield Weather Radio App for your iPhone or Android device and get severe weather alerts wherever you are. Named by Time.com one of the best weather apps for your iPhone.